Hello, friends! I’m so excited to have you here today! 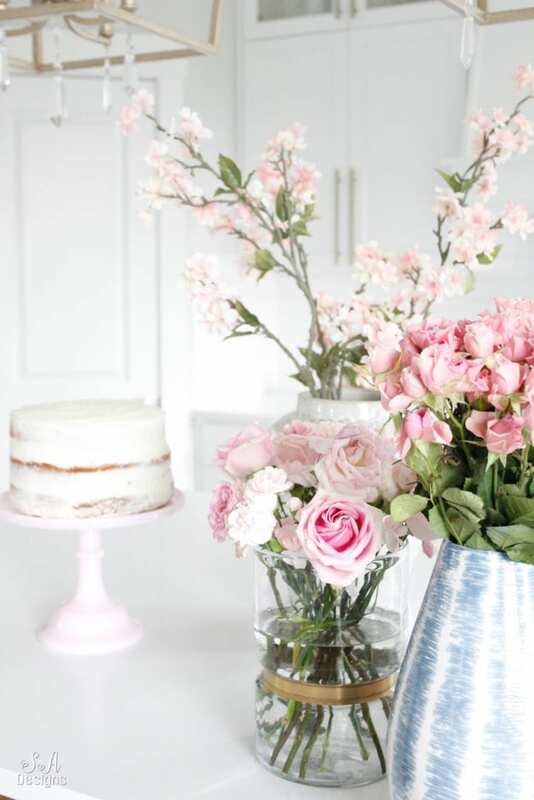 We are gathered again, as a group of bloggers, to bring all of you some fabulous spring recipes. Not only are they all delicious, but they are so beautifully presented and would be a hit at any of your spring events. Make sure to pin all these recipes to Pinterest so that you have them saved! 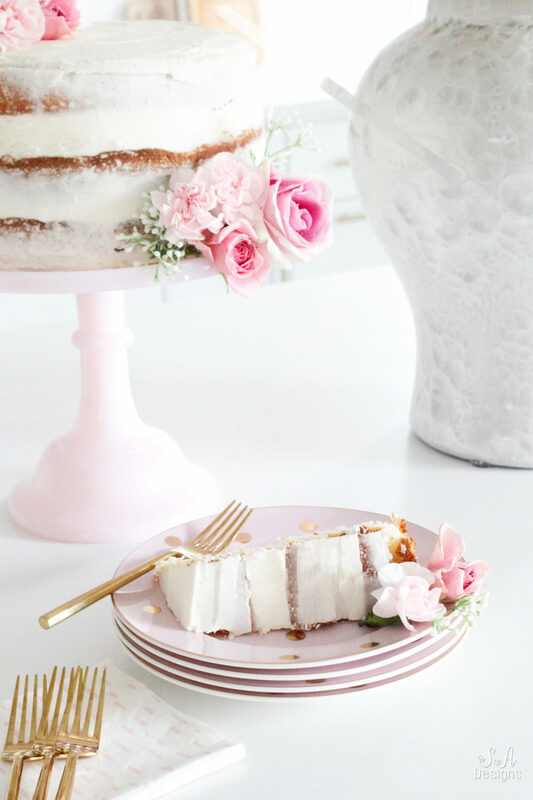 Today I’m sharing my Pink Lemonade Chiffon Naked Cake with you and, from a person who is extremely picky about cake recipes, I can assure you that it is a must-try recipe. 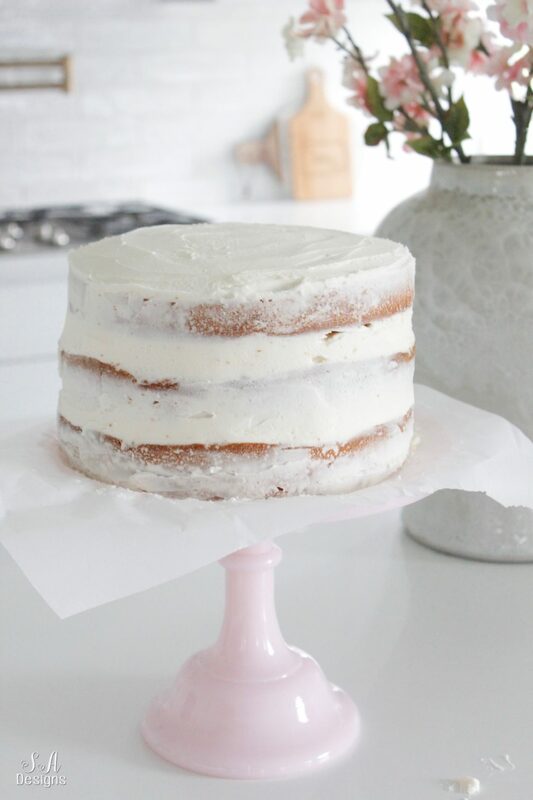 My 12 year-old daughter, Brooklyn, and I decided we wanted to make a naked cake together and share it with you today. 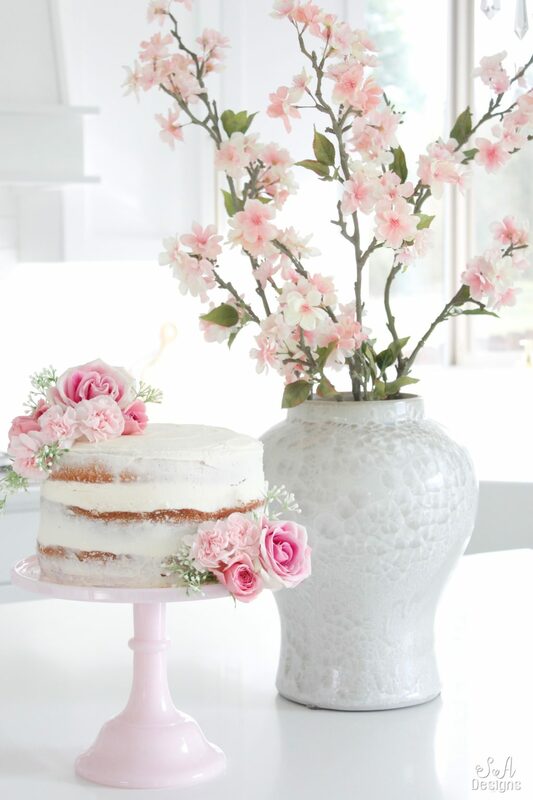 Funny thing though….we both don’t “love” just a traditional cake and frosting recipe. We are really picky. 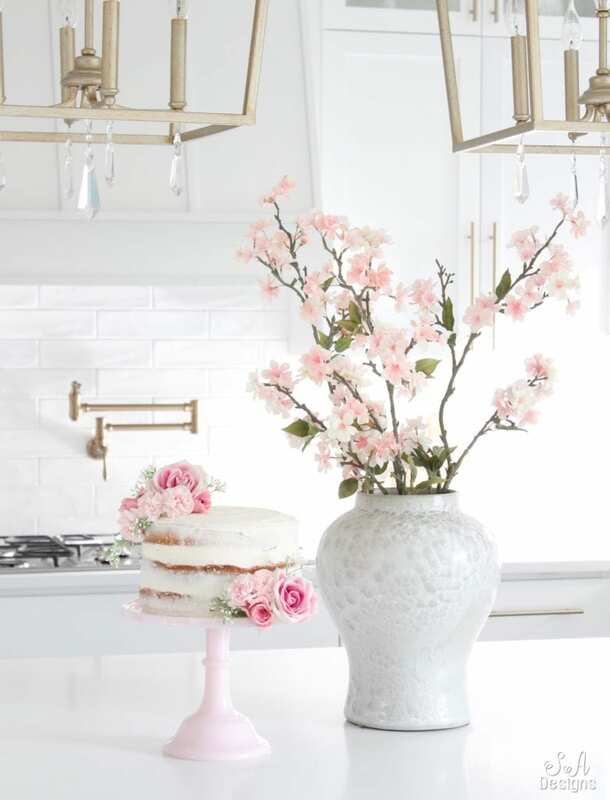 She requests Tres Leches cake on her Birthday and, if I make a cake at home, it has to be one of the really fabulous cake recipes that are in our family. That being said, I remember making a really really good cake a few years ago (and it’s from a box) and that’s the one I’m sharing with you today. If you aren’t a huge lemon person you can still add the lemonade and it will be almost undetectable in the batter but truly makes it delicious and it’s necessary. But if you like the lemon…this is a lemonade cake after all…you will need to add some lemon zest into both the batter and the frosting. I didn’t use it in the frosting this time, since I didn’t want it to ruin the look of my naked cake. 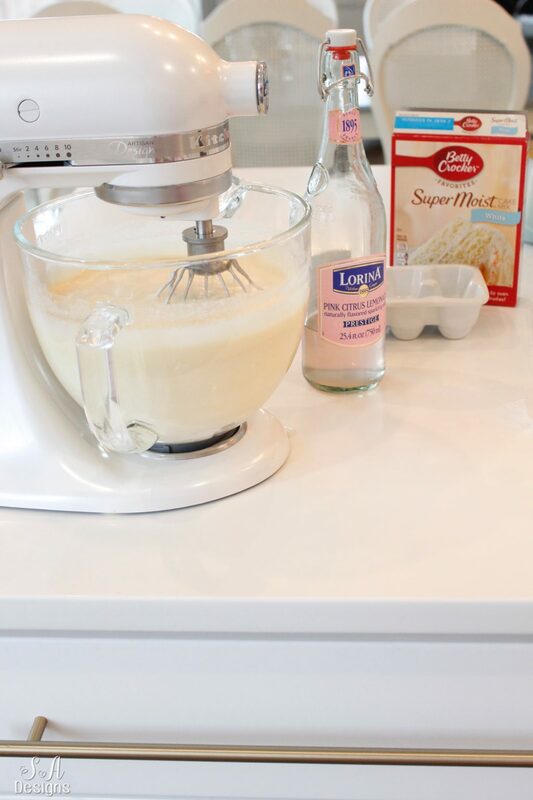 •In bowl or stand mixer, mix on low speed cake mix as box instructs but SUBSTITUTING WATER FOR PINK LEMONADE. So, do not use the water!!! •Make a well in the center of the dry ingredients and add in the egg yolks, oil, pink lemonade and 2-3 drops of food coloring if desired. Beat mixture on medium high for 3 minutes, scraping sides as needed. •In a separate mixing bowl combine egg whites and cream of tartar and beat on high speed until stiff peaks form, will take a few minutes. 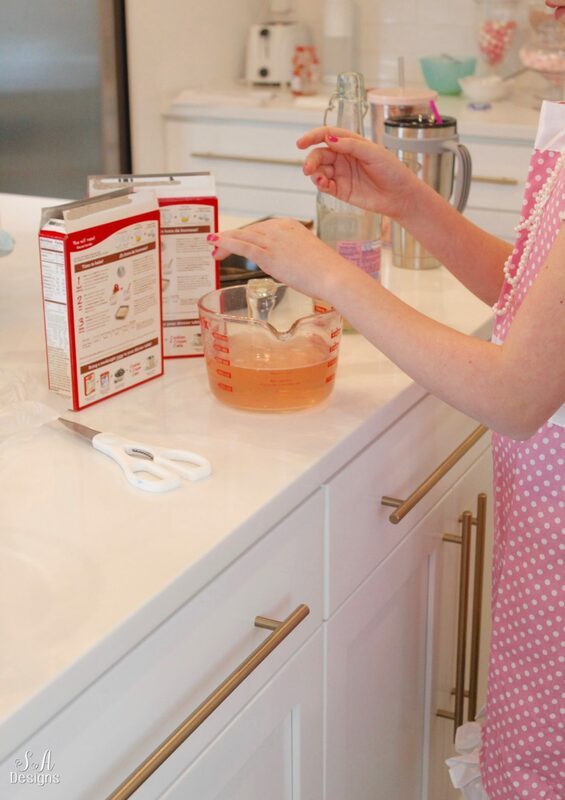 •Fold egg whites into the cake batter and divide equally into the 3 prepared pans. •Bake for 27-30 minutes, checking at 27 min. •Cool in pans for 10 minutes and then remove from pans and transfer to wire rack to cool completely. 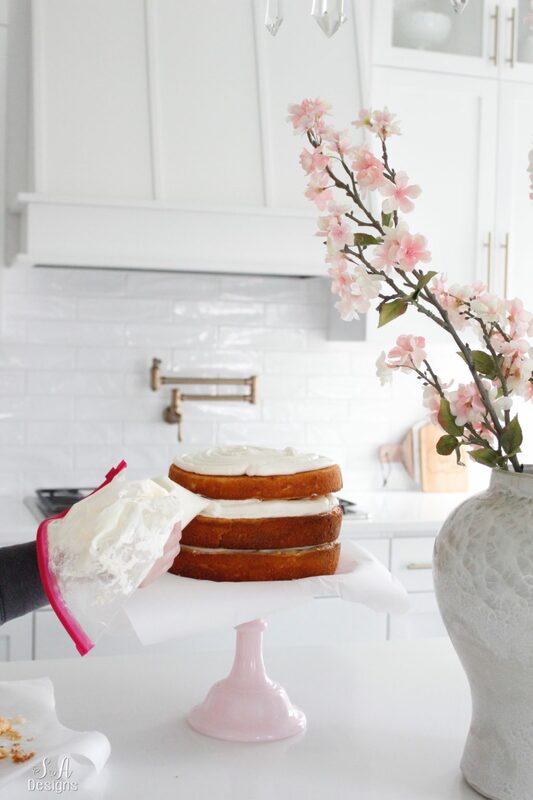 •With parchment paper in between layers, freeze the 3 cakes for a few hours. 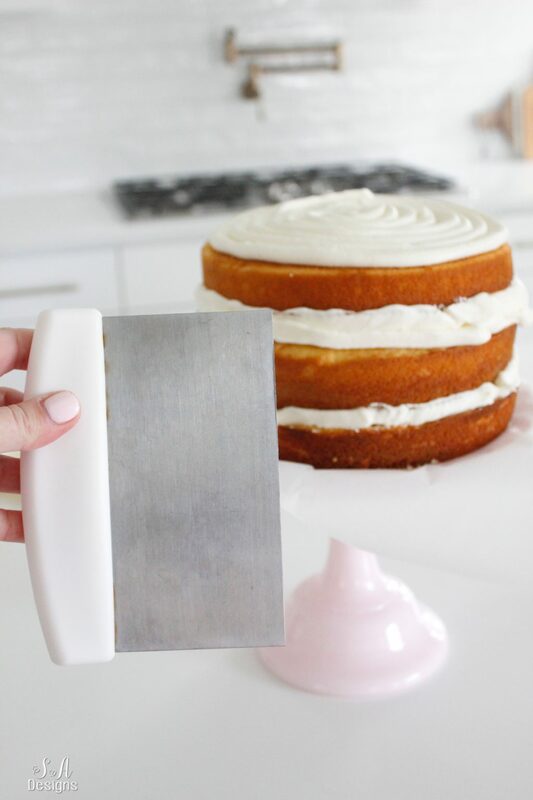 •Remove from freezer and, using a serrated bread knife, cut off the top rounded part of the cake to make it flat. 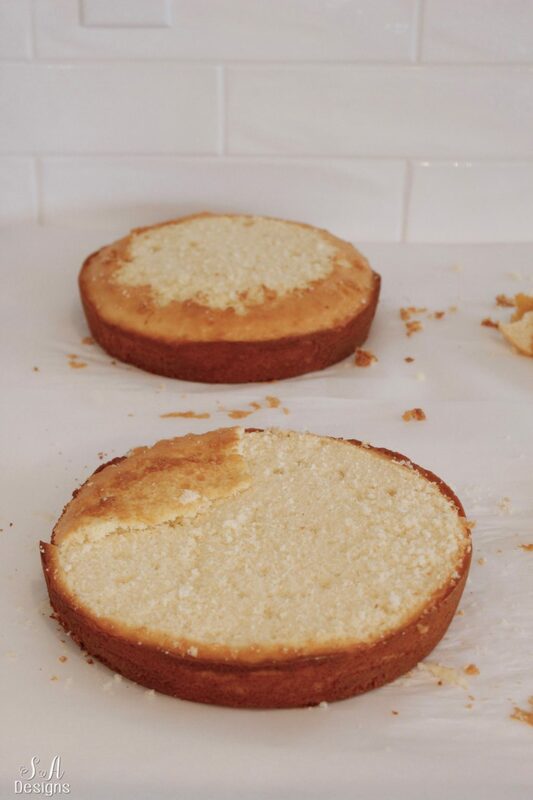 SAVE your scraps of cake because if you cut the cake unevenly, which we happen to this time to one of the cakes, you can take a thin part to put on the lower side so that the cakes will stack evenly and not be lopsided. 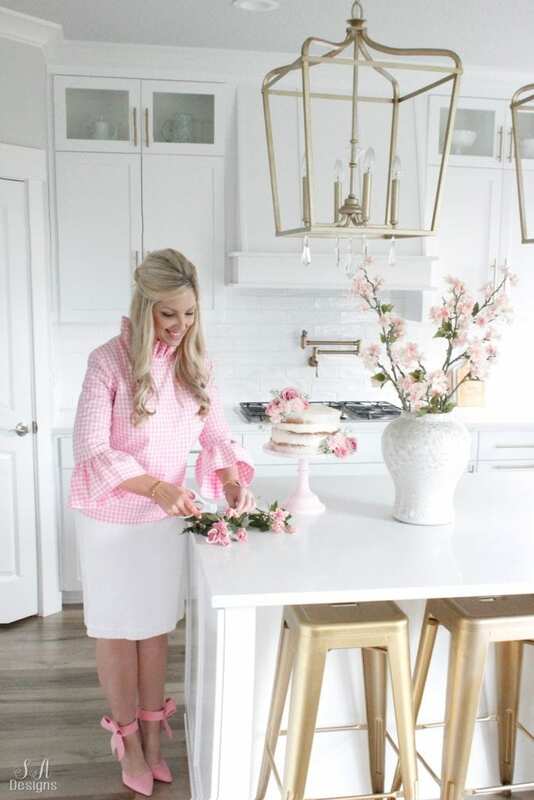 •Split a large piece of parchment or wax paper in half and put on top of the cake stand and then place the first cake on top of it. •Fill large pastry bag (or a Ziplock bag is just fine) with frosting and generously squeeze in a spiral pattern on top of the cake. •Place next cake on top and repeat last step with frosting and then place the last cake on top. •Generously apply frosting to very top layer of the cake. 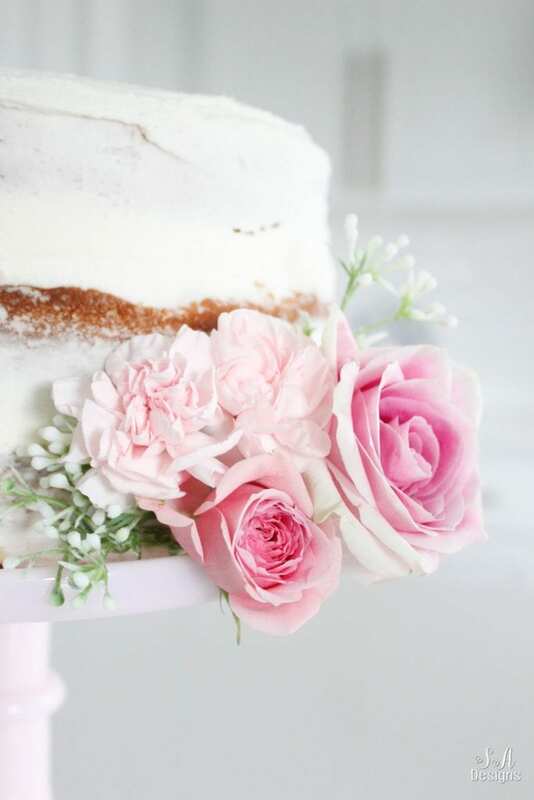 •Fill in uneven parts of cake layers with more frosting and all the way out to the very edge of cake. 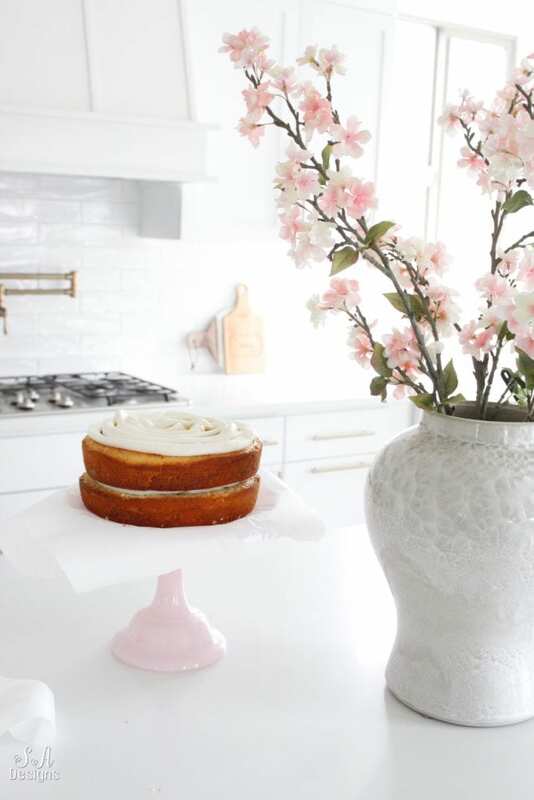 •Take a large scraper to scrape along the outside of the cake as you turn the cake stand. You’ll probably need to pipe more frosting along the “naked” parts of the cake, as to get frosting on every part of the outer edge of the cake. •Continue scraping until you get it how you want it, removing any crumbs in-between scraping. This is when you carefully remove each side of the paper from underneath the cake and discard it. And THAT is how you keep your cake plate clean and ready for decorating. My mom taught me this trick years ago and it’s never failed me. Grab a bunch of fresh flowers to decorate your cake. I happened to have several different bunches of fresh flowers….pink roses, pink carnations, and pink spray roses. I garnished the bottom side of cake with the flowers and also plastic faux greenery that I washed and dried and clipped to size. I created a similar but larger arrangement on the opposite side on top. Now, can we talk about how cute this top is? 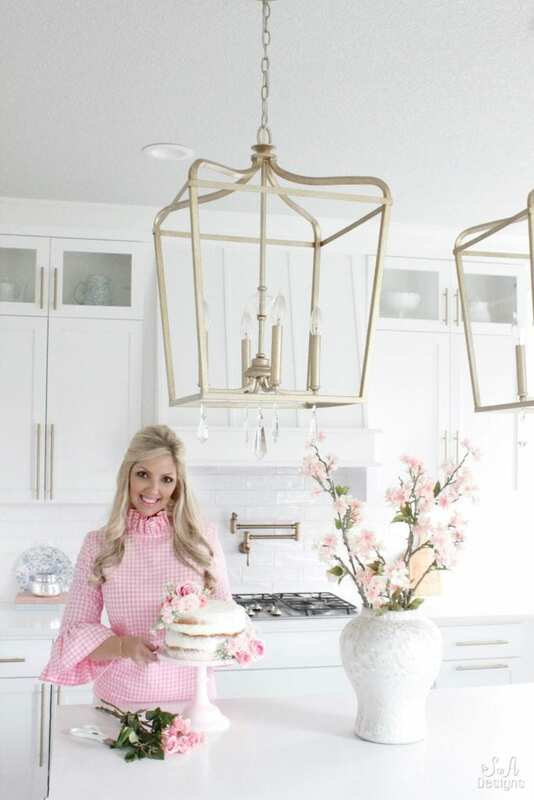 I recently discovered Elizabeth Wilson Designs, a lover of gingham, ruffles and a touch of whimsy! I fell in love with so many pieces in her collection immediately and was thrilled to receive her Katherine Top in pink gingham! With the high ruffle-neck and bell sleeves, I mean….she was speaking my love language when she designed this top. It’s classy, fun, flattering, and just perfect for the spring! I wore it to church already and was stopped right and left to be told that it was the cutest top. You won’t find one like it anywhere else! You’ll see me in something else of hers soon so stay tuned. But until then, make sure to visit her online store and have fun filling up your cart! You can also follow her on Instagram @ElizabethWilsonDesigns. As pretty as this cake was, my family couldn’t wait to tear into it. We may or may not have come home around noon from church and had cake for lunch….and ice cream. Yes, I broke a rule and it was so worth it. All 4 of us enjoyed every single bite! This cake is just delicious! This cake would be perfect for my kids. They aren’t a fan of heavy frosting and love lemon, can’t wait to try it! The cake is beautiful and Your top is super cute too! Yum! Love your pink blouse too! You are just so fun!!!! yes please. that looks so pretty….and delish. 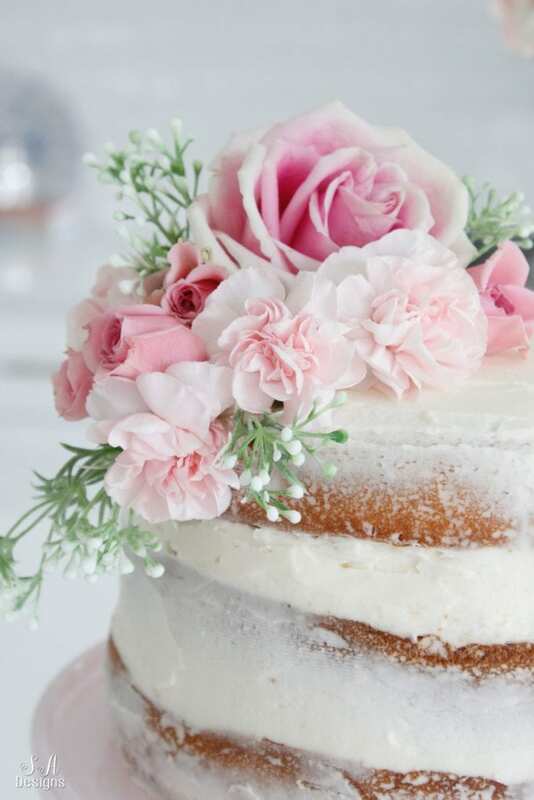 What a stunning cake! Would like to make it for Easter as I am hosting the in-laws (25 people) we are a huge noisey bunch! How could it be adapted for a Gluten free (we have a few that have a gluten allergy. I love your blog! Everything about this is adorable!! I love the addition of lemonade to your cake…and the fresh flowers are so pretty! And your top is SO cute!